Photo by Thomas Heffernan, Sr.
BETHLEHEM — Fire district elections, which will take place this year on Tuesday, Dec. 12, are proving tense in at least two of Bethlehem’s five districts. 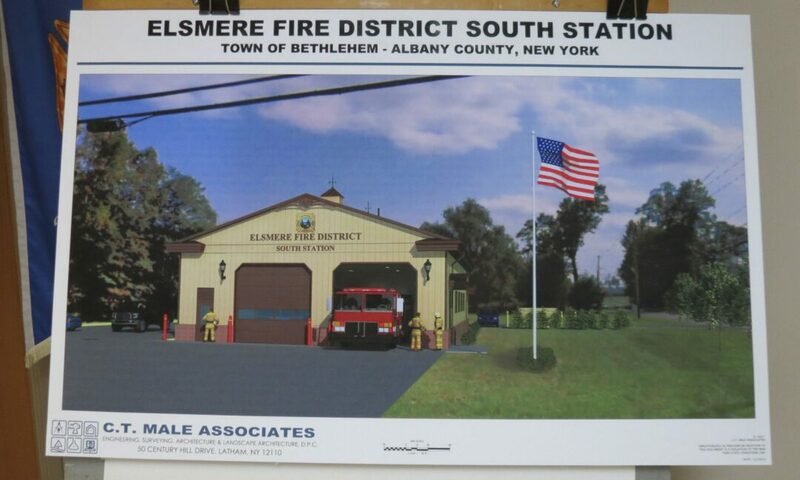 ELSMERE: In the Elsmere Fire District, a ballot proposal to build a new station in order to better serve those in the southern portion of the district is being contested by those who believe that the district should coordinate better with volunteers from the Selkirk and Delmar districts, both of which have a station within a mile and a half of Wemple and Feura Bush roads, where the proposed station would be built on land already owned by the Elsmere Fire District. Elsmere members and residents gathered for the Dec. 6 ballot prop presentation. Photo by Thomas Heffernan, Sr.
A meeting held on Wednesday, Dec. 6, to present the ballot proposal to district residents got heated at points, as members of the town’s various fire districts voiced their opinions on the matter. Elsmere Commissioner Chairman John Brennan pointed to the amount of residential and commercial development in the southern part of the district — which lies between Haswell Farms and Route 9W — and claimed that residential and commercial growth has necessitated the proposed $1.4 million station. Brennan claims the project will not raise district taxes, as $1.3 million will be bonded, for which money has already been set aside in the budget to pay principal and interest payments. The proposed station, which he called “no monstrosity,” would be 4,608 square feet and have two truck bays, although it would initially only house one apparatus. A second truck, said Brennan, may be acquired in the future, as deemed necessary by continued growth. A report published by the district earlier this year identified that area as needing an improvement in “quality level and response time service,” and Brennan said that need will only be exacerbated as development continues. Pointing to a collaborative planning study done done by Manitou, Inc. in 2011, which was commissioned by all five districts, volunteer firefighters opposed to the new building noted that the report essentially recommended consolidating down to two districts. Barring that, it said, “a considerable amount of the benefits of consolidation can be achieved through greater cooperation leading to a functional integration of operations.” One recommendation was to implement a “closest-station response policy. Hedges acknowledged the claim that district taxes would not be affected, but still asked whether $1.3 million couldn’t be put to better use. Elsmere Fire Commissioner Richard Zigrosser “some very important things” were left out of the Manitou report. “So,” he said, “as far as I’m concerned, it’s not worth the paper it’s written on.” He criticized Hedges and the Delmar district for purchasing a new ladder truck after the study, which recommended a reduction in apparatus, stating that the town’s current fleet is more than adequate. Estimated population growth numbers provided by district // Photo by Thomas Heffernan, Sr.
Root acknowledged the growth that has occurred in the Glenmont area, but questioned the accuracy of Elsmere’s predictions for future growth, saying he doesn’t believe the town’s infrastructure would be able to sustain it. He also criticized the district, which claims it’s been planning for this for more than three decades, for notifying district residents only weeks before the vote and presenting the proposal only six days in advance. The vote on the ballot proposition will take place at the Elsmere Fire House at 15 West Poplar Drive in Delmar from 6 to 9 p.m.
Commissioner Richard Webster will also appear on the ballot, running unopposed to retain his seat. DELMAR: In the Delmar Fire District, Fire Police Captain George Williams is running for commissioner against the daughter of sitting Commissioner Pat Dorsey, Heather Dorsey, to succeed outgoing Commissioner Robert Lemieux. In an internal letter sent to members of his district, First Assistant Chief Arlie Hedges criticized Commissioner Dorsey for trying to install his daughter “to further a personal agenda against outgoing Commissioner Bob Lemieux” and gain control of the board. He also claimed Dorsey has plans to install paid fire personnel and do away with the volunteer force. Dorsey defended his life in public service; attacked Hedges, as a line officer, for dwindling volunteer numbers in the district; and said that he has no intentions of hiring paid fire officials. “I will not tolerate you, Arlie, minimizing my dedication to the people of our town,” wrote Dorsey. He then included a description of the powers and duties of fire commissioners in New York state, which can be found under New York Consolidated Laws, Town Law – TWN § 176. On Sunday, Dec. 10, Heather Dorsey emailed her own response to Hedges, accusing him of misrepresenting her reasons for running. 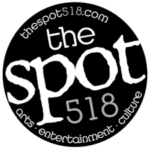 “Not only am I an independent voice concerned with public safety services who once served as a volunteer of the department and as an EMT, I am knowledgeable about local emergency procedures and operations, a local business owner responsible for budgeting and overseeing complex operations, and resident,” she said. She went on to imply that Hedges is interested in maintaining a balance of power that allows him to benefit from the “perks” of his position, one of which, she said, is a vehicle that is paid for, serviced and fueled with taxpayer money — and used for both personal and professional purposes. Dorsey would be the first female Delmar Fire Commissioner since the district was established in 1911. Voting will take place at Delmar Fire Station 1 at 145 Adams St., in Delmar from 6 to 9 p.m.